I have just finished this maternity dress. This was used one of banners of the SAORI Bridges of Elm Park in 2010. It was sponsored by my friend in Japan. 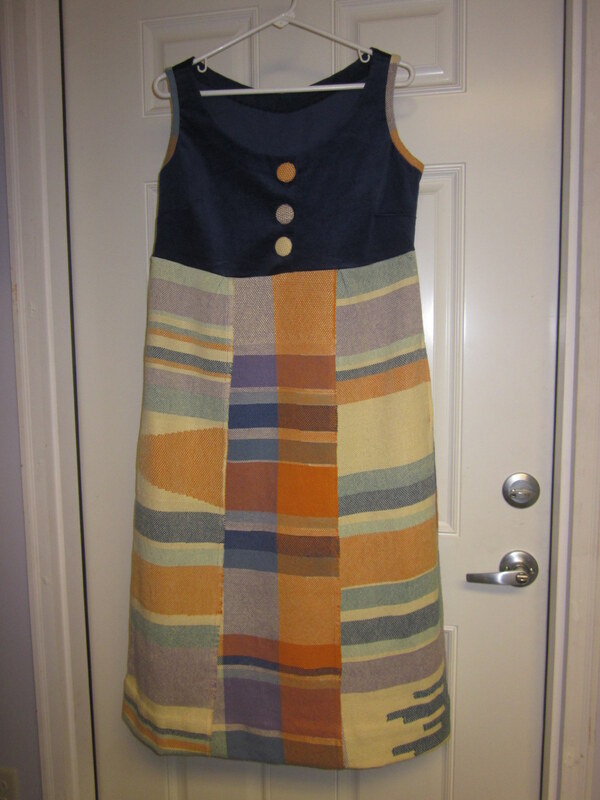 She wanted me to make a maternity dress from it for her daughter. We designed the dress together. There are inside pockets at the skirt and opening at front so she can unbutton to nurse her baby after the baby was born. It was a good challenge for me to make a clothing combining with other commercial fabric which I have not done so much. I chose cotton corduroy with spandex (3%) so it’s stretches a little. Stretchy materials are good for a maternity dress. Since the banner is woven with cotton that matches all right. I arranged using a part of pattern for other clothing for the top part and used “upside skirt” pattern from SAORI book for the skirt part. The trims of the arm holes and the buttons are the charming points for this dress. I hope this fits her well. Mihoko, I am glad to see the finished product. Great work and done with love too. I know she will love it. This came out beautifully! What a wonderful use for the banner!